Michael, the first Category 4 hurricane to make landfall in the Florida panhandle, hit with 145 mph sustained winds, more than enough to cause major wind damage. The central pressure of the storm fell rapidly and was down to 933 millibars, just shy of the most intense hurricanes on record to make landfall in the U.S. This rapid intensification was enough to convince The Weather Channel crews on the ground to flee ahead of Michael’s landfall. In addition, there were tornado watches in effect throughout Florida, Georgia, and parts of the Carolinas. Mandatory evacuation notices were issued for all coastal communities on Monday morning. By early Wednesday, with tropical storm force winds and rain already underway and streets in coastal communities already flooding, the time to flee had passed. Like Hurricane Florence before it, Michael resulted in potentially catastrophic water damage, dropping as much as 13 inches of rain and generating a storm surge of up to 14 feet in some areas. 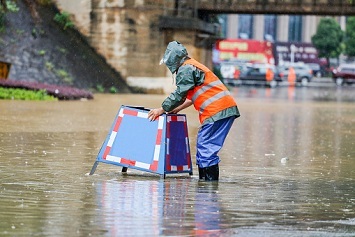 These conditions can be extremely dangerous, as flood waters not only pose immediate risks, but, as the Centers for Disease Control and Prevention (CDC) highlights, they can have long-term impacts on health and safety. In addition to swift currents, flood waters can also hide immediate hazards like nails, screws, and broken glass—highly likely after a destructive storm. Even more troubling, these waters have the potential to contain sewage from damaged septic systems, agricultural and/or public waste water facilities. This increases the risk of spreading infectious disease to anyone moving through the waters. Check out these helpful tips from the CDC for addressing the fallout of the storm and lingering flood waters. Be sure to wear appropriate personal protective equipment (PPE), including rubber boots, rubber gloves, and goggles during facility cleanup. If the storm created conditions for mold damage, wear the right gear to protect yourself. Get rid of any items that cannot be washed and disinfected (such as mattresses, carpeting, carpet padding, rugs, upholstered furniture, pillows, foam-rubber items, books, wall coverings, and paper products). Remove and discard drywall and insulation that has been contaminated with sewage or flood waters, including materials located a foot higher than the high-water line. Thoroughly clean and sanitize all hard surfaces (such as flooring, concrete, molding, wood and metal furniture, countertops, appliances, sinks, and other plumbing fixtures) with hot water and laundry or dish detergent. Speed up the drying process using fans, air conditioning units, and dehumidifiers. Wash clothes contaminated with flood or sewage water in hot water and detergent, preferably at an off-site laundromat. Do not use any onsite laundry equipment until your waste-water system has been professionally inspected and serviced. Flood waters can contain infectious diseases, such as E. coli or Salmonella. Be careful and use proper handwashing techniques after any contact with flood water, or items affected by flood water. There is an increased risk of Leptospirosis following a flood. Be sure that all water is treated prior to drinking, especially if it comes from a source that was potentially affected by exposure to animal urine or runoff. Keep an eye out for rodent activity, particularly around food. Keep uncontaminated food and water in closed containers and trap any rodents you may see. Avoid exposure to flood waters if you have any open wounds, as these are a vector for serious infection, and seek medical attention if you suspect you may be at risk. Be aware of chemical risks, as any hazardous material containers kept at your facility may have been damaged during the storm, and their contents could be in the water. If you come across any propane tanks or other explosive containers that may have shifted or washed into your facility, do not approach them. Call emergency services and let them send an appropriate response team. Be aware of potential electrical hazards, such as fallen power lines or car batteries. Do not drive through any standing water where a power line has fallen.